The people or Edo State have been called upon to cast their votes for the People Democratic Party, PDP candidate in the forthcoming governorship election in the State. The Delta State Deputy Governor, Barr. Kingsley Otuaro made the call in Benin at the flag off of the PDP governorship campaign held at the Baptist Convention ground, Benin City. Barr. Otuaro said the emergence of Pastor Osaigie Ize-Iyamu as the flag bearer of Edo State was divine pointing out that the candidate has all it takes to take the State to enviable level. He described the affirmation of the Senator Markafi Caretaker Committee by the Court as a boost to the party and urged the Ali Modu Sheriff led faction to join hands in rebuilding the party to recover lost glory. A member of the Caretaker Committee, Senator Orion Ugbesia who presented the flag to Pastor Ize-Iyamu said the party presented it to him for his victory at the primaries held for all aspirants under the platform of the party. The Governor of Akwa Ibom State, Mr. Udom Gabriel Emmanuel who spoke on behalf of other governors said the PDP has cure to all challenges bedeviling Edo and other parts of the country. He called on the Edo people to vote for PDP as the party has well tailored programs to bring the needed development the people have been yearning for. The Edo State Chairman of the PDP, Chief Dan Osi Orbih, said the flag bearer, Pastor Ize-Iyamu has been tested and could lead the State to the desired destination. A top PDP chieftain in the country, Chief Tom Ikimi said the Edo State was a stronghold of the party hence the need for all Edo people to throw their support behind Pastor Ize-Iyamu to enable him use his SIMPLE agenda to turn the fortunes of the State around. The PDP candidate for the governorship election, Pastor Ize-Iyamu pledged to use his wealth of experience to transform all sectors of the State,s economy. He said his mission was to serve his people and not to gather wealth at the expense of the people. Other speakers at the occasion said the use of the Baptist Convention for the flag off was a clear indication that God would give victory to the PDP at the governorship election. 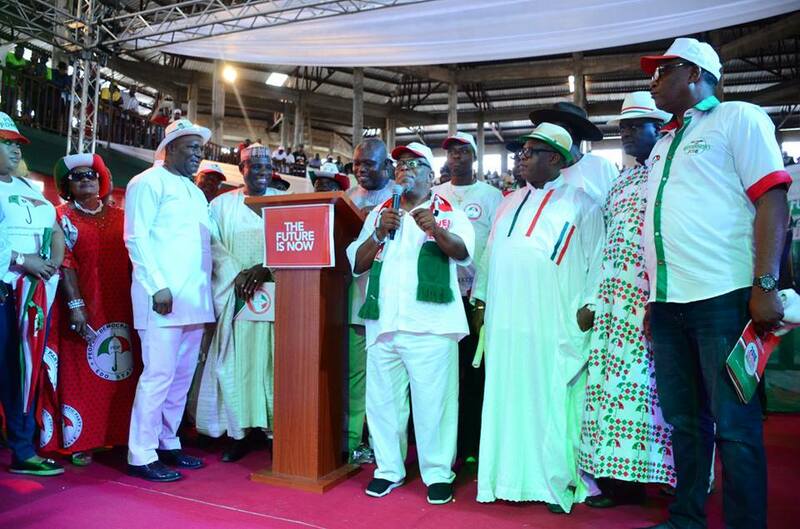 At the event, some members of other political parties in Edo State defected to the PDP. The flag off was attended by PDP stakeholders from all part of the country which include Prof. Jerry Gana, Senator Ben Obi, Chief Tony Anenih, Chief Gabriel Igbinedion, Senator Stellar Omu, Chief Ighoyota Amori, Chief Emma Ogidi amongst others. Previous Previous post: OSANEBI SPREADS EMPOWERMENT TO CONSTITUENTS, DOLES OUT MILLIONS FOR SMEs.